Tag line: "Step Inside a Hollywood Dream Factory"
20th Century Fox: The Blockbuster Years picks up where The First 50 Years left off: with 1965’s The Sound of Music. Heralded as the picture that saved Fox following the disaster that was Cleopatra, The Sound of Music was a box office sensation (after its initial run, the movie had brought in over $100 million worldwide). But despite the film’s overwhelming success, audiences in the late ‘60s and early ‘70s were in the mood for something new, and as a result, big-budget musicals like Hello, Dolly and Dr. Doolittle failed to recoup their costs. As it had been just a few years before, 20th Century Fox was once again on the verge of collapse, and it would take a whole new approach to the art of filmmaking to turn its fortunes around. 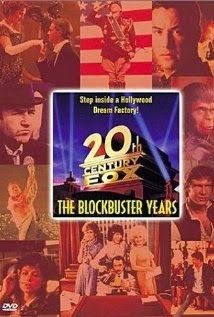 With James Coburn returning as narrator, 20th Century Fox: The Blockbuster Years covers what I consider to be one of the most exciting periods of creativity in cinematic history: the 1970s, when brash young filmmakers took the industry by storm, delivering the kind of entertainment that people were clamoring for. In 1970, the studio released two very different war movies: Patton, a biopic about the controversial WWII general; and Robert Altman’s MASH, an irreverent comedy that, despite being set during the Korean War, had plenty to say about Vietnam as well. The era also saw such films as the hyper-realistic The French Connection (which, like Patton, was named Best Picture by the Academy) and the incredibly fun Butch Cassidy and the Sundance Kid. In addition, The Blockbuster Years chronicles the birth of the disaster genre (which kicked off with a pair of Irwin Allen productions, The Poseidon Adventure and The Towering Inferno), and takes us back to May 25, 1977, when the worldwide phenomenon that was Star Wars first hit the scene. From Alien to Revenge of the Nerds, and from The Omen to Edward Scissorhands, 20th Century Fox: The Blockbuster Years is, like The First 50 Years before it, an exhaustive, clip-heavy documentary about one of Hollywood’s most prolific dream factories, and a glowing memorial to the movies that made it great.